If you cannot remember your renewal date or have a question, please call (800) 989-8137. The NCPC is not affiliated with the US Deptartment of Veterans Affairs. The National Care Planning Council is working to help VA notify accredited attorneys and agents of their responsibility to submit a required yearly certification of good standing. 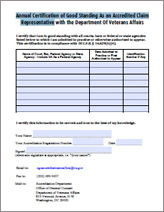 as a further condition of initial accreditation and annually thereafter, each person seeking accreditation as an agent or attorney shall submit to VA information about any court, bar, or Federal or State agency to which the agent or attorney is admitted to practice or otherwise authorized to appear. Applicants shall provide identification numbers and membership information for each jurisdiction in which the applicant is admitted and a certification that the agent or attorney is in good standing in every jurisdiction in which admitted. After accreditation, agents and attorneys must notify VA within 30 days of any change in their status in any jurisdiction in which they are admitted to appear. The form to the right may be submitted to the Office of General Counsel (instructions are included) to meet this requirement. As a free service, the National Care Planning Council will continue to notify all accredited attorneys and agents (on their yearly anniversary of accreditation) of the need to provide this certification and will provide a link to the free certification form with instructions.